This year, the TodaysArt of The Hague and Cimatics of Brussels festivals fused and so last September, TodaysArt Brussels set itself up in several places around the city. The Almost Cinema and STRP festivals on the other hand, which took place respectively in October and November, remained in their regular spots: the Vooruit Theatre in Ghent and the Eindhoven Strijp quarter. What could be more impersonal than a station when they more or less all look like one another, and when one only goes through them to go somewhere else. By closing one's eyes, all the stations in the world would only differentiate themselves by the vocal sound of their announcements. It is precisely the Brussels Midi train station where the art research laboratory Locus Sonus has set up their installation of eight sonic showers. Each one is linked to an open mike via Internet, somewhere around the world. All one needs do to hear the sonic imprint of a distant landscape is to stand directly under the satellite dish. The spectator, or rather the listener, is invited to connect their smart-phone to the project website to identify where the audio flux is coming from. Only a few steps are needed then to go from Boston to Reykjavik, where the sounds of the Guadalajara de Buga in Valle blend with those of the Midi train station. Where is this birdsong coming from? What hour is it there? It is also good to forget the map and discover these territories by listening randomly to the sounds of the world in a place that is dedicated to travel. The meeting point of the TodaysArt Festival in Brussels adjoining the Midi train station also houses a sound installation. It is called "Tessel" and was developed through the collaboration between the artist David Letellier and the LAb[au] Collective. Its title is derived from the term "tessellation", which describes the subdivision of a surface into polygons. "Tessel" is itself subdivided into about forty triangular surfaces, certain of which are controlled by motors while others are equipped with audio transducers. 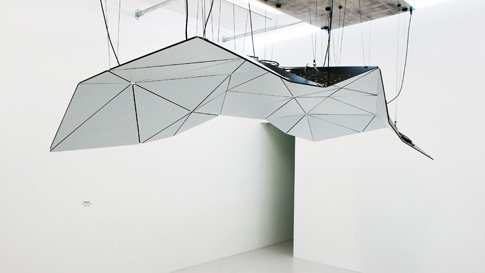 This large scale folding which is hung above the spectators is in constant evolution. The grainy sounds it emits places those who are sheltered by its metamorphoses in a situation of sonic immersion. The movements, like the sounds, seem to stretch on forever while this kinetic sound sculpture seems like the invisible part of a limitless and invisible whole, all over. "Tessel" is unstable, in transition and these fragments are the perpetual transmission of mechanical efforts – a meeting of art, mathematics, geometry and physics. The Theatre of Vooruit in Ghent where the Almost Cinema Festival takes place is vast and its rooms are also. Yet it is a small room that Julius Von Bismarck has selected for his installation performance "Space Beyond Me". After converting it into a digitally controlled projector, he has set up a 16mm camera there. The apparatus moves on its axis to the rhythm of the camera movements inherent in the shots collected by the artist. In the dark all around the spectators, the circular screen that has been previously coated in phosphorescence, preserves the traces of the Ultra Violet rays of an immediate past. Consequently, it is the light that, as in a cinema, reveals the history that a photographic procedure only preserves temporarily. 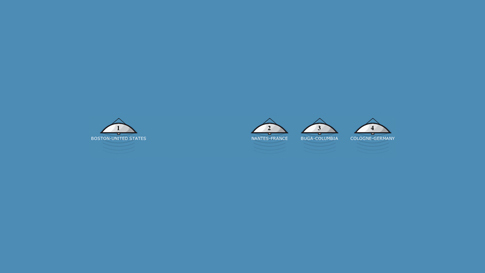 The spectators can then return to a particular sequence of the film that progressively covers the zones of the panoramic surface. 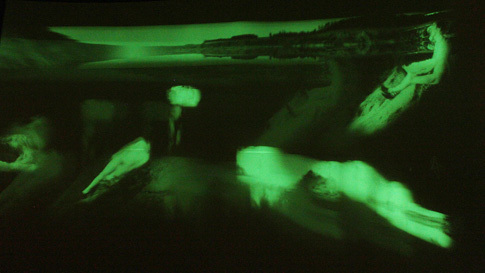 When the projection ends, the still fresh phosphorescent traces of the end merge with those from the beginning, which have already faded while the sound of the film installation has stopped. In this way it is possible to sweep the entire length of the film in an instant while recalling the movements of the anonymous camera operators. Still in Vooruit, there is a rather unusual theatre play entitled "This is not my voice speaking". The participants are re-baptised Zero and One before going into a room from which they will only emerge thirty minutes later. 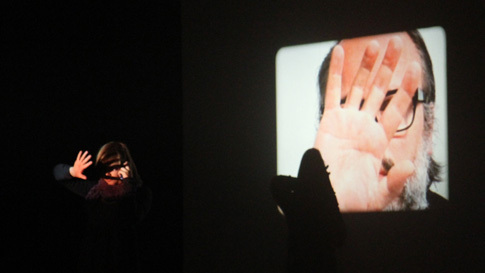 A slide projection gives them their first instruction. Other instructions follow that the participants must execute alternatively without knowing what they're about. They are neither real actors nor real spectators. The artists Ant Hampton and Britt Hatzius have prepared everything in advance and so all the details that the next participants find in the set will be like the previous participants found it. Once the first group has passed through, the experience can automatically repeat like a ritual of which one knows neither the origins, nor the consequences because one only executes the sequence of orders of a script like a machine interpreting an algorithm, step by step. The neutrality of the tone of voice that commands confers a scientific character to this experience, whose real purpose we ignore. It inevitably recalls the experiments conducted by Stanley Milgram in the beginning of the 1960's. In a building adjoining the Vooruit Theatre, Kathy Hinde presents the sound installation she has named "Piano Migrations". It involves the interior of an upright piano that has been modified by the addition of a few solenoids or electrical piston motors. 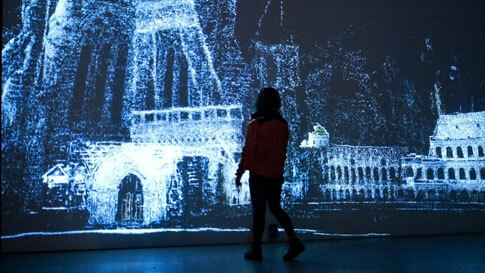 The entire installation is set up vertically and is, itself, enhanced by a projected video image within which we can see the silhouettes of birds who come to sit on power lines and who then fly off just as quickly. The choreography that is created through the arrivals and departures of these feathered creatures in the image, triggers the pistons in the installation. 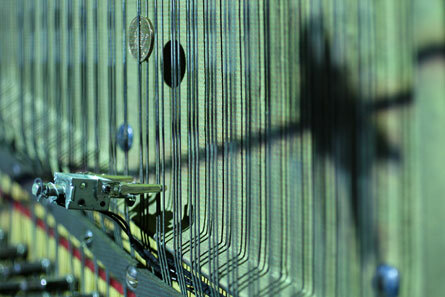 In this way, metallic sounds emerge from the chords of the piano when they are struck for real by the virtual passage of the birds. Randomness is one of the essential elements of the music that is now played after being written by nature. And when the birds have left, it is silence we perceive, making us think of John Cage and his prepared pianos and their four minutes and thirty three seconds of silence. There are security barriers protecting the works. But those that surround "Spatial Sounds (100 dB at 100 km/h)", developed between 2000 and 2001 by the Dutch artists Marnix de Nijs and Edwin van der Heide, are designed to protect the spectators. They are even an integral part of the work. 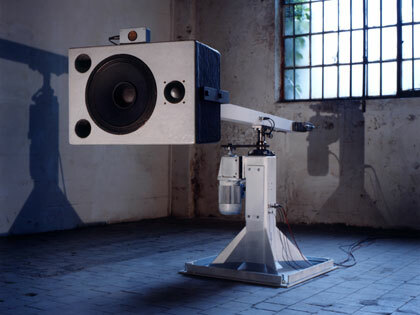 Without an audience, the powerful speaker that makes up the major part of this sonic installation emits only sounds of weak amplitude in this vast room of the Klokgebouw housing the STRP Festival. Without any particular excitation the machine swirls around in relatively slow rotations until it comes upon an intruder. It becomes active, turns back, hesitates and does a few more turns around its axis. When suddenly it frees itself to turn at a speed that can reach 100 km/h. The sound it generates is then at the level of its high speed and reaches 100 dB. This alone fully justifies the barrier that defines its territory. Having apparently gone out of control, it is the show of its power and the energy it gives off at top speed that gives it its aesthetic beauty. 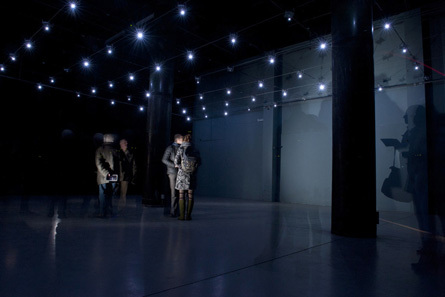 Going from one room to another, energy is again the question where Edwin van der Heide presents the performance "Evolving Spark Network" that also exists in the form of an installation. A matrix of cells has been set up above our heads. Powered electrically, the cells alternatively generate sparks. The light crackles to the rhythm of the sounds that ring out in the space. By liberating a contained energy, the artist is thinking of electrical impulses that in the infinitely small carry information within our nervous systems. We can also see the compressed representation, in space as in time, of a constellation of stars liberating through light, the energy that consumes them. The installation races out of control at the end of the performance. The rhythm picks up until, retinal persistence contributing, a grill of dots appears before us in its totality. And then there is silence whose intensity reveals the end of this exchange of energy in the celestial body that is above us. Lastly, it is in the main exhibition room of the STRP Festival that Marnix de Nijs makes it possible for visitors to interact with reconstructed urban landscapes. Because moving physically in the space of the exhibition comes down to moving about in the three-dimensional images of the installation, "Exploded Views". It is in real time that the machine exploits innumerable photographs to position particles that reconstruct monuments in three dimensions. The original views come from the Internet and the more there are of them, the more detail there is in the image. The first views Marnix de Nijs has produced represent Florence, one of the most photographed cities in the world. Taking a photograph of the dome of Santa Maria del Fiore and loading the image into Flickr makes it all the more visible. But when the machine takes hold of it, it is also an opportunity to reconstruct the city of Florence in three dimensions from the sum of all points of view. Written by Dominique Moulon for Digitalarti and translated by Geoffrey Finch, January 2012.